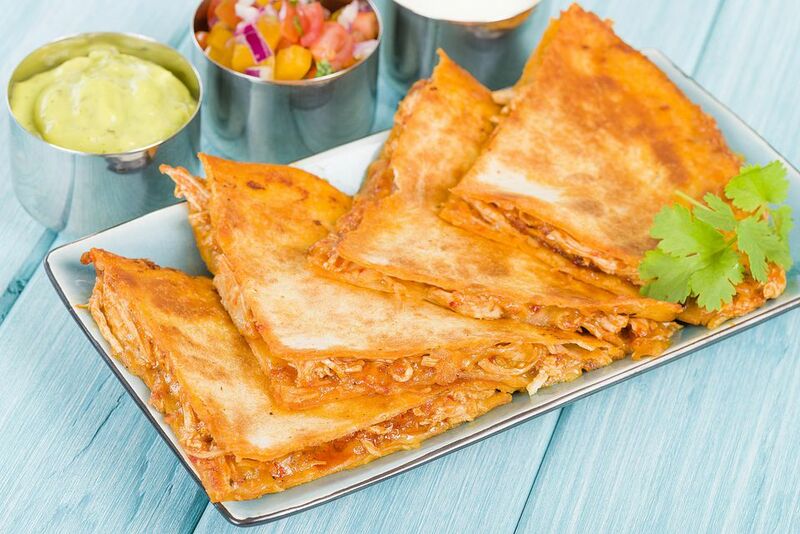 Masala Chicken Quesadilla is a great example of fusion food. It is a concept I use often in my kitchen... taking a dish (from another country) that we love as a family and interpreting it differently... putting an Indian twist on it. The results are always delicious! Mix the yogurt and sour cream together in a bowl and whisk together until smooth. Add the chopped mint leaves, grated cucumber, cumin powder, red chili powder, sugar, and salt to taste. Chill in the refrigerator till needed later. Heat the oil in a deep pan on medium heat. When hot, add the cumin seeds and sauté for a minute. Add the sliced onions and fry till soft. Add garlic and ginger pastes and fry for a minute. Add all spice powders (including garam masala) and fry until oil begins to separate from the masala (spice-onion mix). Add the chicken mince now and brown, stirring very frequently. When the chicken has browned, add the tomato and salt to taste. Stir well and add 1/2 cup of water. Cook till chicken is done. There should be almost no gravy at this stage. Cook until all the gravy has dried off. Lay one tortilla on a plate and spread Mint-Coriander Chutney on it. How much is a matter of personal choice. Add roughly four to five tablespoons of the cooked chicken and spread on half the tortilla. Sprinkle with grated cheddar cheese–according to preference. At this stage, you can 'toast' the tortilla in a sandwich toaster or on a hot pan on the stove until the cheese has melted. When all the tortillas are done as above, cut each one into triangles. Serve while still hot with the yogurt-cucumber dip you made earlier. Add salsa for the perfect finishing touch!